Wait a minute. Is director Ridley Scott changing history again? “I sleep with a dagger. Warning: This may be considered a review that contains a number of Spoilers. If you are offended by spoilers, wait until after you've seen the movie to read it. Also, if you consider what I reveal as spoilers, you really need to see more of these types of films. Much like the beginning of Gladiator, Robin Hood opens with the majestic sight of a flaming arrow flying high into the air. So begins the latest epic from the director/actor team of Ridley Scott and Russell Crowe, and so begins my attempt to review Robin Hood on its own merits and avoid any comparison to their other action adventure film Gladiator. An attempt in which I will ultimately fail. And why will I fail? Because even though they are different films with different plots (Gladiator, with its protagonist who is out to avenge the death of his wife and son, and Robin Hood, whose hero is fighting the English crown on behalf of the overtaxed and oppressed poor), they are alike in that they share similar story structures and genre tropes (and both were done by the same director). Hollywood continues its ongoing crusade of non-originality by traipsing out the latest film based on the legends of Robin Hood. After all, the last serious incarnation (sorry Men in Tights) was director Kevin Reynolds's Robin Hood: Prince of Thieves, itself grounded in reality by the thespian certitude of Kevin Costner, which came out in 1991. Heck, that's a lifetime ago! But not to worry. With the muddled expertise of the most able-tongued politically correct double-talker, Hollywood has ensured that this film is not yet another remake. It is a radically rethought revision re-imagined as a re-rendered reinterpretation. Not content with wanting to rehash the old familiar Robin Hood legends that we are no doubt sick of (it's been 800 years after all), Scott chose to craft a new legend that was, instead, a rehash of the old familiar Hollywood legends about heroes. Scott has set his story before Robin became an outlaw and explores the making of the Robin Hood legend. This is a bit unusual, since many of the films deal, to a certain degree, with how he became an outlaw, but this filmreally deals with it. Gone is that old boring meeting between Robin and Little John on the wooden bridge. Gone is the pesky archery competition to drive the “Mythbusters” mad. No more do we have to deal with robbing from the rich to give back to the poor. Whew! Now we have the old boring modern conflicted hero who is unsure about his place in the world. Now we have the pesky political machinations of a young power mad King. Now we have to deal with yet another familiar action climax of massive armies and the inevitable mano y mano face off (Oh, wait. 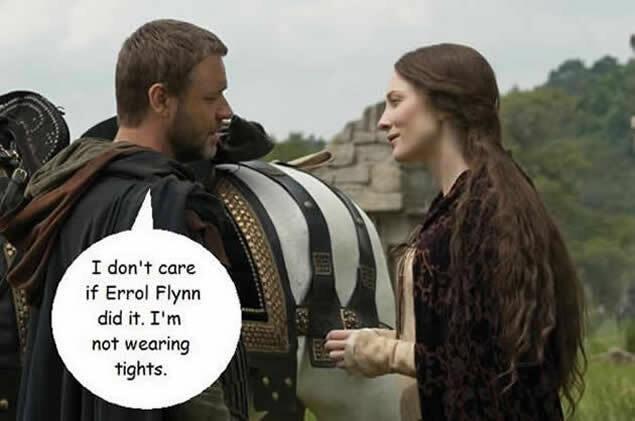 Even Errol Flynn's Robin Hood had that. But that one was better!). Russell Crowe plays Robin Longstride. This Robin is not noble born but when we meet him, he is nobly firing arrows in the service of King Richard the Lionheart (Danny Huston). Lionheart is fighting his way through France in an attempt to return to England from the Crusades. Along the way Robin has met his future comrades, Will Scarlet (Scott Grimes), Allan A’Dayle (Alan Doyle), and, at the start of the film, Little John (Kevin Durand). His first meeting of John is not in the flying collision of staffs, but of fists; probably a bit more realistic but not nearly as interesting or exciting. Robin, disillusioned with the king, decides to make his way back to England on his own. Against his better wishes and through some unknown reasons of loyalty, his three friends accompany him. Along the way, he crosses paths with a Robin Loxley, who they discover relaxing by the road dying. This is thanks to an ambush by Sir Godfrey (Mark Strong), an Englishman who is secretly in cahoots with the French. If it wasn't known that he was evil before, with his glowering demeanor and shaven head, it should be guaranteed thanks to the malicious scar that he acquires by an arrow from Robin. In this scene, Robin takes aim with his bow, let's fly, aaaand misses! Why? Because Godfrey is the main villain, so there's no way he's going to be taken down this early in the film. “Ha! Ha! I've got six more reels before you can kill me!” After this, the dying Loxley passes his sword along to Robin to return to his father. Meanwhile, the English ruler, Prince John (Oscar Isaac), himself petty and inexperienced, wisely takes council from his mother, Eleanor of Aquitaine (Eileen Atkins), and William Marshal (William Hurt) as to how to pay for the costs of the Crusades, then promptly ignores their advice and decides to impose heavy taxes on his already overtaxed English subjects. Meanwhile, the afore mentioned villain, Godfrey, with the aid of the French King, has smuggled into England a regiment of French soldiers. Pretending to be English troops, these raiders are sacking English towns in an effort to incite a rebellion against Prince John, who is almost too stupid to realize the danger that his kingdom is in, for when this rebellion is in fruition, the French army will land in England and conquer it. Meanwhile, Robin arrives at the village of Nottingham with the sword of Loxley, and meets Loxley 's father, Sir Walter Loxley, (Max Von Sydow), and Loxley 's now widowed wife, Marion (Cate Blanchett). Sir Walter convinces Robin to pretend to be his son, and thereby protect the family's property, much to the chagrin of Marion, who not only has to traipse around the village with this complete stranger, but also must share her bedroom with him. And here's where I fail and veer into Gladiator comparisons. For though this film is riddled with clichés, so too a certain degree, was Gladiator (I mean, come on, Commodus summed up the movie’s plot to Maximus right before the end of the film). Where Gladiator had a strong antagonist, whose rivalry was developed throughout the film, Robin and Godfrey really come at odds only once and that is when Godfrey is riding away after the murder of English soldiers. Other than that, the story separates them and deprives the audience of a really juicy rivalry. Where Gladiator had intrigue and bursts of action before the story's climax,Robin Hood is burdened with long stretches of mundane exposition and perfunctory character development which is offset with very little action. Sadly, when that action comes, it lacks any interesting choreography and results in being less than exciting, unlike the action in Gladiator, which was extremely visceral. The trick is to take what is structurally familiar, what the viewer knows is coming, and tweak or change it entirely, so that it will be interesting and watchable. Predictability can be made tolerable if it's done well; if the acting is well done, if the machinations within the scenes engender interest, and the action rises to the level of creativity that it deserves. And if you protest that it is unfair to compare this film to Gladiator, please feel free to choose a different film such as Scott's ownKingdom of Heaven, or Braveheart, Spartacus, Ben-Hur, and just about any other action adventure film dealing with heroes. Russell Crowe creates a deadly serious Robin. I mean deadly serious. He says and reveals little, brooding about his past, where he's come from and where he's going, putting the modern take on the old hero and, as a result, Robin loses any charm that he may have had. Now while Crowe plays this part without missing a beat, meaning that he's solid in what he's asked to bring to the role, the role doesn't ask much of him. He gets to play solemn, introspectively solemn, and warriorly solemn. But he brings no warmth to the character, no passion. This is a Robin who allows the circumstances to push him along from one decision to another. He's not really choosing as much as going with the flow. So when it becomes time for him to lead, the moment is more awkward than inspirational. Cate Blanchett brings her usual professionalism to Marion and I had hopes that there would be some smoldering passionate sparks between her and Robin; this is, after all, one of the most legendary of relationships. But, again the problem lies in what this Marion is asked to do. Because of her youth and standing, she is more or less the leader of Nottingham, but the film goes too far and crafts her as a 21st century women in pre-Renaissance Faire clothing. Worse yet, though she yields to the wishes of her father and pretends that this Robin is her husband, when her relationship with Robin starts to bloom, Blanchett plays it as “romantically solemn”. It is a credit to both Crowe and Blanchett that they are able to rise above the, at times, mediocrity and still be thoroughly watchable. Max Von Sydow plays Sir Walter with a charming grace and becomes one of the most likable characters in the film. Though I must wonder, isn't it bad luck for someone of Max Von Sydow's age to be playing a death scene? Mark Strong is adequate at his villainous task. He has a knack for this sort of role and can sneer with the best of them. William Hurt is also a welcome addition, and though doesn't have much to do, it's always fun to see him on the screen. This is a film whose success is ultimately reduced by a pedestrian story. This saddens me since, when I saw the trailers, I was eagerly looking forward to this film (cue the “My expectations were too high” whiners). One gets the sense that Scott may have intended more for this film. It seemed odd for him to go for a PG-13 rating and I wonder how much studio interference there was in the writing and cutting of the film. But even if Scott intended a different film, there are some unforgivable lapses. There are too many people and an awful lot of talking. Everyone is able to cross England to meet the French just as they are arriving at the beaches, which I find impressive, and I have a car. And when Marion appears in full armor to join the final battle, I hit the point where I felt the film had “jumped the shark” (or “nuked the fridge” as the new saying goes). There's a lot of good in the film that is sadly overshadowed by the bad. What we have is a Robin that fails to live up to itself or its predecessors. There's no thrill, no real excitement, and in the end, no fun. This Robin won't be legendary.